Optional Power 2/550-hp Cummins QSC8.3 diesels with Zeus pod drives; 2/435-hp Volvo Penta IPS600s, or various conventional inboard powerplants. 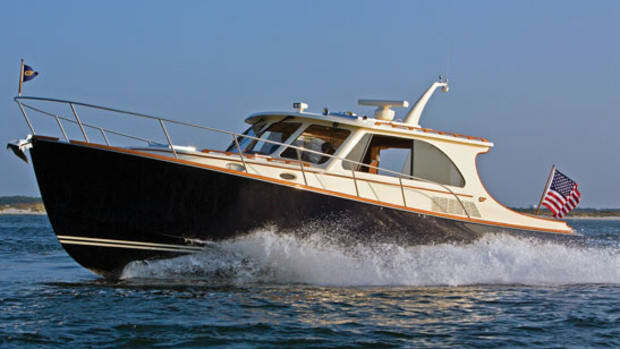 A Hunt-designed hull and Hamilton waterjets combine with Maine boatbuilding tradition in the Custom Lyman-Morse 42 known as Peregrine. Cruising up the St. George River from Port Clyde, Maine, at a comfortable 26 knots, I took my hands off the wheel of the just-launched Lyman-Morse 42 Peregrine, waiting to see what would happen. The good news is, nothing happened. Peregrine, with her C. Raymond Hunt Associates-designed deep-V hull and twin Hamilton waterjet drives, just kept tracking, straight and true, cutting through the deep-blue water on a beautiful Chamber of Commerce summer day; at nine in the morning, there was no wind and the only ripples on the water came from the wakes of lobstermen, gathering their pots. Then, to test the jets’ performance, I put the wheel over. Drew Lyman, the head of Lyman-Morse, had done this a few minutes before, so I had a good idea of what to expect. Since jets steer a boat by directing thrust (rather than diverting it, as in a traditional prop and rudder situation), turns tend to be immediate. The wheel is sensitive, to say the least. So I resisted my normal instincts to crank it all the way over, and turned gradually. Holy smoke! Peregrine is named for a raptor, and a peregrine falcon is perhaps the fastest bird in the world, with the ability to dive and outflank its prey at great speeds. The boat lived up to her name. She doesn’t carve a turn exactly; she simply turns, instantaneously. The response is immediate, and fun. I had to restrain my impulse to slalom all the way back to the Lyman-Morse dock. 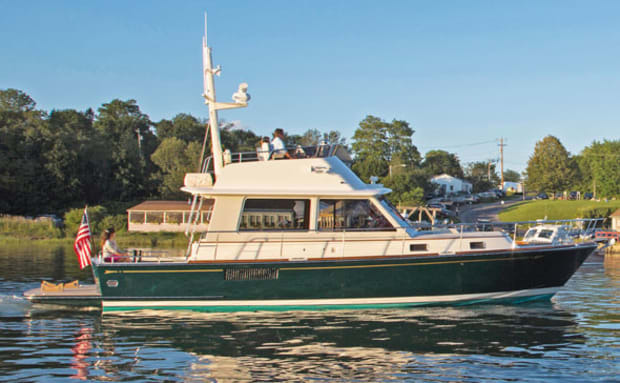 It felt like I was driving a high-performance sport boat, but this was a beautiful 42-foot classic Down East flying-bridge yacht, built for an owner who wanted to cruise nearby Penobscot Bay in the summer or as far as the Bahamas in the winter. As we straightened out and cruised up the river, I asked Lyman why the owner wanted jets. “Look around,” he said, and laughed as he pointed to the water ahead, dotted with dozens of pot buoys. With jets, there are no underwater appendages such as struts, shafts, props, and rudders to get entangled in whatever’s floating in the water or just under the surface. Having snared more than a few barely submerged lines and pot buoys in my day, the peace of mind offered by jets is hard to describe. Cruising can be fun again. The point is that in Peregrine, Lyman-Morse delivered what the owner wanted. Since the owner, who asked not to be identified, has a family summer home on an island nearby, waterjet propulsion was a top priority. 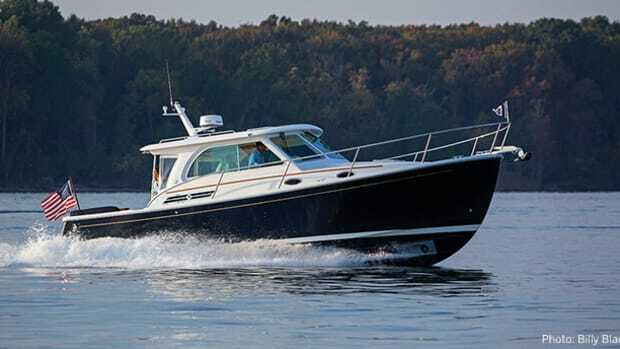 After that, he wanted a cruising boat that he and his wife could take anywhere, in any kind of weather, with a Down East look and understated elegance both inside and out. 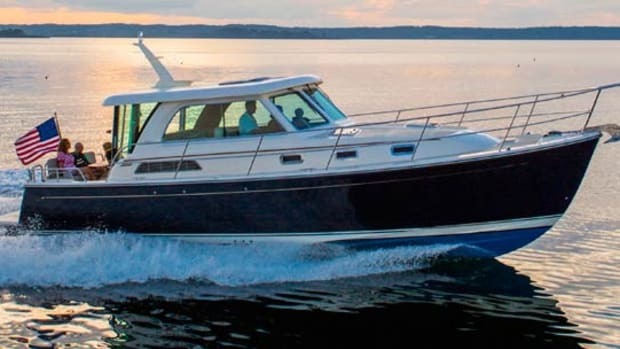 He also wanted a couple’s boat; this 42-footer has a single cabin and one head (although a generous one, even by 60-footer standards). Another couple could sleep on the sofa in the saloon, of course, but it’s clear the boat is really designed just for the owner and his wife. For Peregrine, the owner turned to Lyman-Morse, located on 12 waterfront acres at the top of the St. George River in Thomaston. 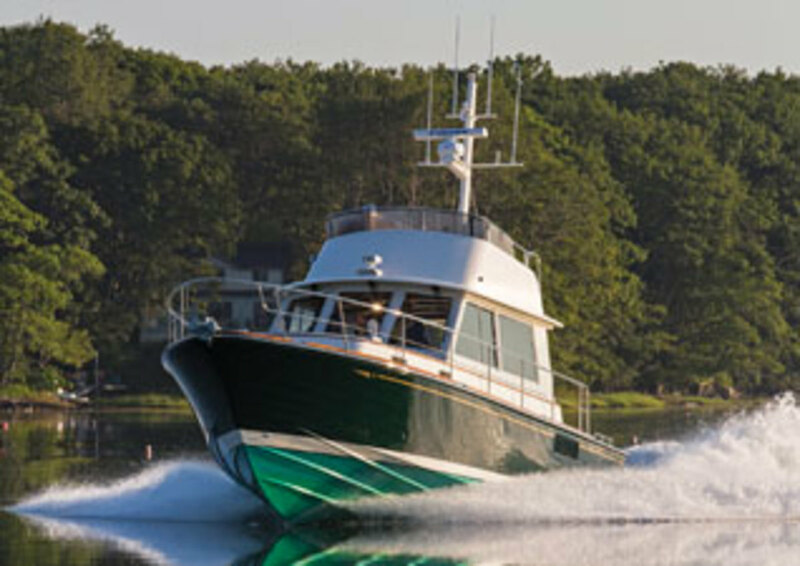 Lyman-Morse has been building custom and semi-custom yachts for the past 35 years, and has earned a reputation for outstanding quality and craftsmanship. The yard also works with a variety of designers, in this case collaborating with Peter Boyce of C. Raymond Hunt Associates, one of the most famed design firms in the world. Boyce and the Hunt design team are hardly strangers at Lyman-Morse. 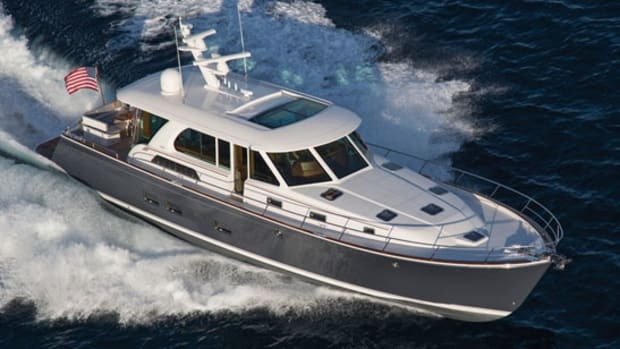 Indeed, Boyce has designed 16 yachts for Lyman-Morse over the years; one of the most successful was Whistler, a highly acclaimed 54-foot Down East cruiser (also with Hamilton waterjets) that was launched four years ago. 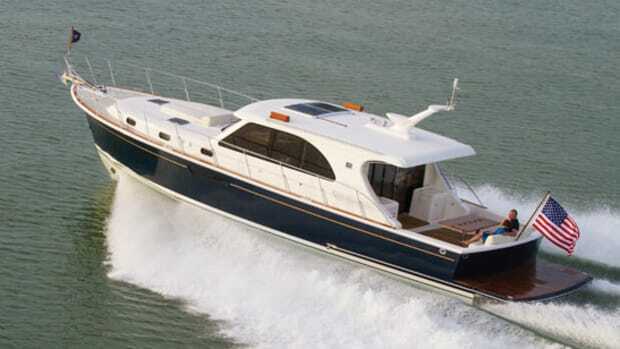 Boyce used an existing 42-foot Hunt deep-V hull mold for Peregrine. “It seemed a perfect fit,” he said. “The mold had provided hulls for a number of boats, including six earlier custom boats built by Lyman-Morse. 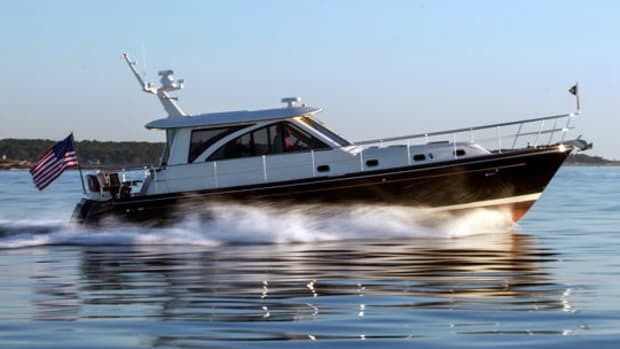 It is, to say the least, a well-proven hull.” Waterjets, it turns out, are particularly responsive to deep-V hulls, tracking better than they do with shallower hulls, where they can tend to wander. To maximize performance, Boyce put Peregrine on a diet, taking weight off through the SCRIMP infusion process, using e-glass and vinylester resin in the hull, and building cored bulkheads and joinery work. The owner also opted for powerful twin Cat C9 ACERT diesels, producing 567 horsepower each. The result: a top speed of 33.8 knots, not bad at all for a flying-bridge cruising boat with traditional Down East lines. In the end, Peregrine displays classic Hunt styling, with timeless lines that will never go out of style. If you want a floating condo or a Euro-style cocktail cruiser with a lot of bells and whistles, look elsewhere. That’s not what Hunt does. 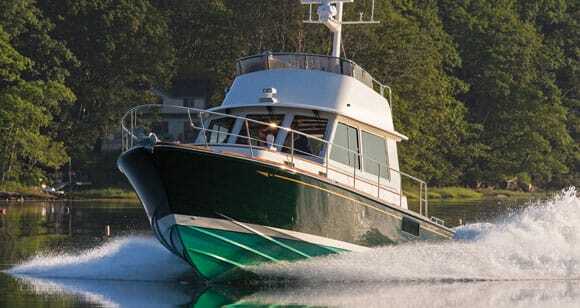 In addition, the owner (an active environmentalist) wanted a straightforward, no-nonsense, built-in-Maine boat. “This is traditional Maine understatement throughout,” Lyman said. “That’s what the owner wanted, and that’s what we do best.” Even the plumbing and electrical systems were designed for the owner-operator, with practical applications a top priority. But when you look at the boat, two examples of elegant understatement catch your eye. First are the custom curved teak toerails, shining with multiple coats of varnish and crafted more like those on a megayacht than on a 42-foot Down East boat. “We wanted to give the owner something special,” Lyman said. And then there are the small “LM” (Lyman-Morse) initials dropped out of the gold cove stripe up near the bow, requiring a second look as they stand out against the custom deep-green hull. The easiest way to climb onboard Peregrine is via the super-sized teak swim platform (complete with chocks for a dinghy) and through the equally solid, inward-opening transom door. Or you can climb over the side into the cockpit, helped by a teak cockpit step and heavy-duty stainless grabrail at the end of the house. The side decks going forward are wide and protected by a high railing. Line handling is easy; cleats are in all the expected places, including cutouts in the toerails for spring lines. The front windows are raked, both to suggest movement and to reduce water spray and glare, while a thin strip of teak along the length of the house is just enough to suggest the boat’s Down East heritage. 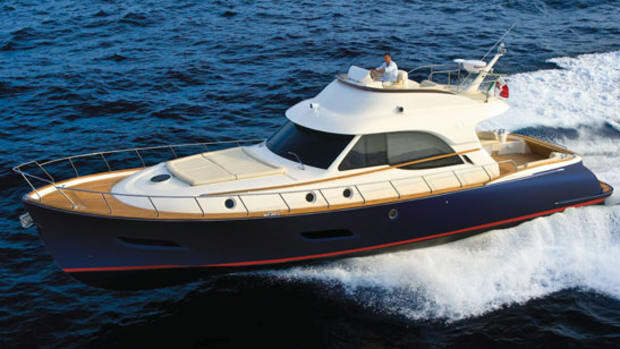 The teak-planked cockpit is large enough for easy socializing, with a custom seat that folds down against the transom, and a built-in, aft-facing seat next to the ladder leading to the flying bridge on the port side. A good-looking propane barbecue is built into the starboard side, waiting to be fired up. A large sliding glass door leads to the saloon, which is about as straightforward as they come, with a small sofa to starboard and an L-shaped sofa to port, facing a beautiful table with drop-down sides and an inlaid compass-rose design. The interior woodwork and joinery is varnished mahogany; the sole is teak and holly. In keeping with the overall design theme, the overhead is minimalist/traditional, with white paint and varnished crossbeams; a sturdy sea rail runs almost full-length. 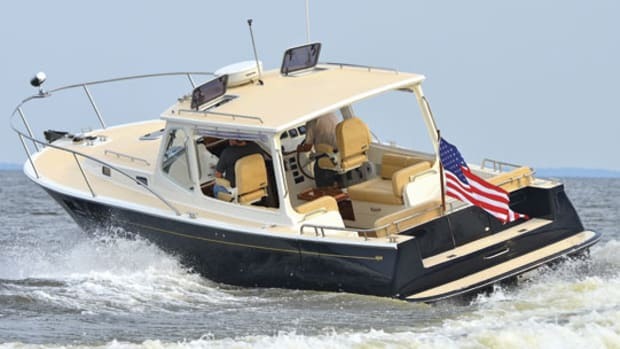 A Stidd passenger seat is forward to port, across from the helm, which has a two-person bench seat. Sightlines from the helm itself are excellent all around. A U-shaped galley is down three steps to port, with lots of light and white countertops and enough stowage for a long cruise (or to make the cook happy on an extended weekend). Across, to starboard, is the apartment-sized head, with a full, separate shower and a curved, custom sink and, once more, an unusual amount of counter and stowage space. The master stateroom (the only stateroom) is forward, with a walkaround queen and lots of woodwork in the offing; it’s a warm and inviting place. Access to the engine room is through a large hatch forward in the saloon and it’s laid out with access on all sides to the big Cats and aft to the Hamilton waterjets (you can also reach the jets through a large hatch in the cockpit). Headroom in the engine room is crouching level, but then I’m 6 feet 2 inches tall. One neat feature is access to the 7.6-kW Westerbeke genset. It’s all the way forward against the bulkhead, but it can be pulled aft on stainless tracks built into the top of the stringers (Lyman pulled it out to show me this with one hand) so you can easily work on or service any part. Heading up the St. George, running at an optimal cruising speed of 26.5 knots at 2335 rpm and 25 percent tabs down, Peregrine was flying at her prime. Lyman-Morse had just recalibrated the steering and put in skegs, 2½ inches deep and 6 inches long, out by the chines, for tracking stability, and everything seemed dialed in perfectly. Air temperature: 82°F; seas: flat; no wind. 260 gal. fuel, 115 gal. water, 3 persons, 500 lb. gear. 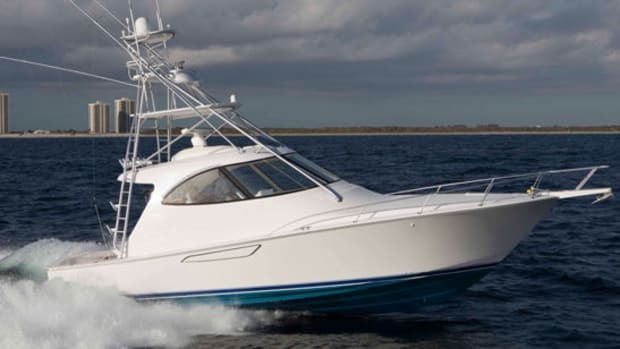 This article originally appeared in the May 2014 issue of Power & Motoryacht magazine.